Prepare for adventure under the high seas matey! Reports of a giant sea monster attacking ships around the world abound and the US Navy is going to save the world. With the help of French marine biologist Monsieur Aronnax, his servant Conseil and Canadian whaler and harpooner Ned Land, the Navy frigate Abraham Lincoln sets sail. Popular theory among the crew is that the creature is a giant narwhal….rare whales with long tusks protruding from their heads… the unicorns of the sea. After weeks of searching, the ship finally encounters the beast in the dark of night, but it’s simply no match for it. An epic sea chase ensues … the beast rushes the frigate….Aronnax is thrown overboard and the faithful Conseil goes in after him. Ned’s harpoon hits the spot to no avail and he finds himself overboard also. 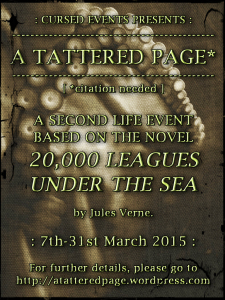 It’s time again for A Tattered Page…Cursed Events clever take on a book club in SL. This time the book is Jules Verne’s “20,000 Leagues under the Sea”, a classic science fiction novel published by Verne in 1870. Here’s how the book club works…..when the title is decided upon, both the designers and the bloggers read…or reread…the story. The designers create something from an inspiration in the story and the bloggers write…about the story, the characters, the issues of the day…whatever inspires them. The creations are available both in the designers stores and in a common event space…The Tattered Page Library. Come by and see what the this story of the sea inspires. Have a look at the designers on the website, and if you are inspired to read 20,000 Leagues Under the Sea…it’s available online for free @ Online-Literature.com. 20,000 Leagues Under the Sea (Post-187859) - [O.L.D.] Old London Docks - Best Second Life Fashion and Lifestyle Blog Feeds!